Biographical: He drifted off the race track, hit a bump, and flew over the handlebars while traveling at a speed of about 180 MPH. He landed face-first at the edge of the race track. He was transported to Deaconess Medical Center in Spokane where he died from his injuries shortly after arriving. 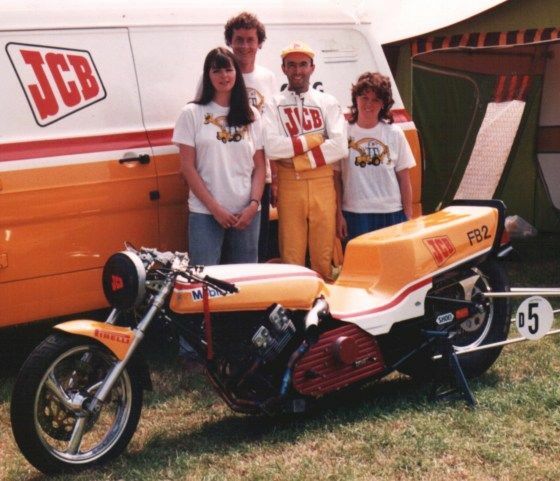 He hadn't ridden top fuel bikes for a number of years, but was the principal tuner on the fatal bike which he had been working on for another rider. He was a veteran racer of eleven years and was from Abbotsford, British Columbia. He was survived by his wife, Cindy, two sons and a daughter. Biographical: His dragster split in half as it raced down the track and crashed into a concrete retaining wall during qualifying. He was transported by helicopter to the Louisiana State University Health Science Trauma Center in Shreveport. He died early the next morning from severe trauma. 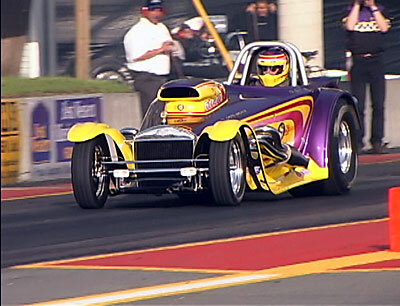 His best time in the dragster was a 4.95 and 293.73 MPH. He resided in Leonard, Michigan. Full Name: Dennis Ray Baker, Jr.
Biographical: He was testing a newly-built dragster when the throttle stuck. He tried to slow the car by scraping it against the retaining wall. Unfortunately the dragster rolled over. He was paralyzed from the waist down in the accident. He developed an infection several days after the accident and died in University Hospital in Cincinnati. He was survived by his parents, brother, sister, and his fiancee. Biographical: Just after being clocked at 104 MPH, he lost control of the car, veered to the left, struck some water barrels, and flipped over. It was the first fatal accident at the race track in 18 years. He lived in Greenwood, South Carolina. Biographical: On his final run he lost control of his car at a speed of 150 MPH and it rolled violently. He was survived by his wife, Sandra, and two sons. 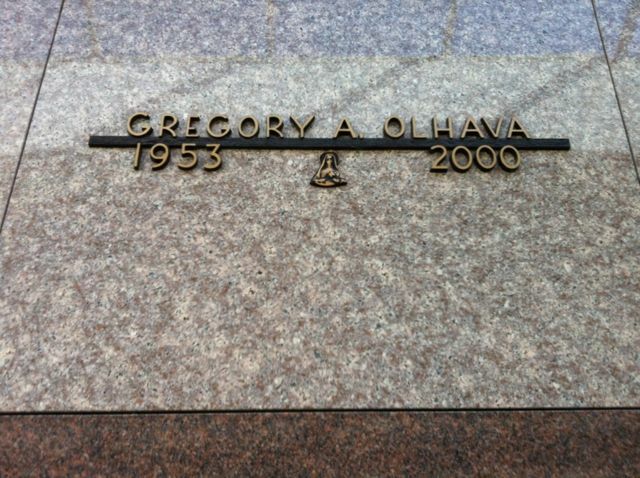 He was from Taylor Ridge, Illinois. 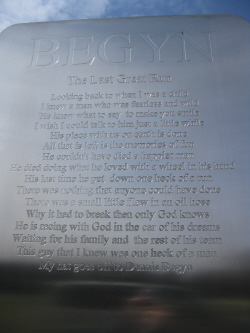 His sons built an 8-foot tall stainless steel tombstone to memorialize him. Some thought the tombstone was a work of art, but it sparked controversy with others. Biographical: He suffered a fatal heart attack during the race. 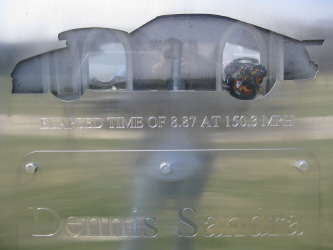 A veteran of twenty years in racing, he lived in Marble Falls, Texas. He was survived by his daughter. Biographical: After reaching a speed of 155.76 MPH on his second qualifying run, he lost control of his car and crashed in the sand trap at the end of the shutdown area. The car eventually stopped in a creek after smashing through several barriers. He was transported to St. Louis University Hospital Trauma Center where he was pronounced dead. He was from Worthington, Ohio. Biographical: During an exhibition run, his jet dragster reached a speed of 198.85 MPH, but his parachute failed to open. He tried to stop the speeding car with his brakes, but rolled several times in the sand trap before crashing into trees. He was taken to a nearby hospital where he was pronounced dead. He was survived by his wife, Gina, and a daughter. They lived in Malvern, Ohio. 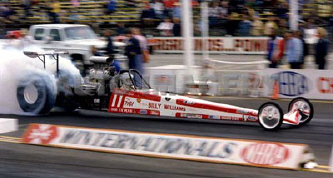 His fastest speed to that date in the jet dragster had been 322 MPH at 4.929 seconds. The engine was a J-60 Pratt & Whitney. Dustman was killed only seconds after this photo was taken. Biographical: He was racing against the Prock & Howell A/GS entry and crashed. He was transported to Methodist Hospital in Indianapolis where he later died from his injuries. He lived in Peabody, Massachusetts, and was survived by his wife, Shirley, and a son and daughter. 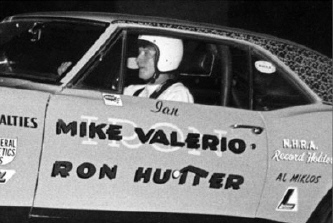 He had been racing since the 1960s and had formerly been a crew chief and partner in the Boston Strangler funny car. 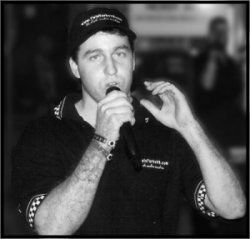 He was on the board of directors of New England Dragway. Biographical: A missing gas cap was the cause of fuel leaking under the tires. This caused his tires to spin and the car went into a slide. It tipped over onto its side and burst into flames. He was transported to University Hospitals in Iowa City where he died four days later. Biographical: He was traveling at about 250 MPH when his parachute malfunctioned at the end of the race track. The car slid sideways and turned over and over about six times. He was transported to Sacred Heart Medical Center. He passed away two days later after his family opted to take him off life support. He was a resident of Pocatello, Idaho. Biographical: In the course of making an exhibition run against Al Hanna, his car suddenly veered left, hit a wall, spun around, and hit the opposite side wall before catching fire. While racing to put out the fire, the fire crew began playing out the hose, but unfortunately the hose got lodged under the wheel of an ambulance. The hose snapped and all the foam retardant spilled out on the race track. The jet car continued burning for more than ten minutes. Witnesses reported that it had been announced prior to an earlier test pass that the chassis may have been cracked prior to the run. He was transported to Grady Memorial Hospital in Atlanta where he died, with burns covering most of his body. He lived in Franklin Furnace, Ohio, and was survived by his wife, Shonnie, and family. 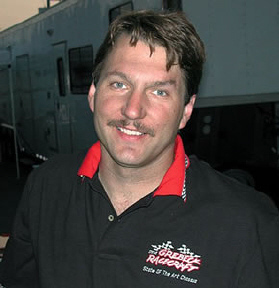 He garnered "Rookie of the Year" honors in 1993 by Jet Pro, the jet car racing sanctioning body. 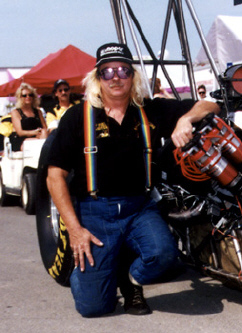 He had the most wins in the jet car ranks during his career. Biographical: He lost control of his car when it was traveling at a speed of 154 MPH. Just after crossing the finish line, his back end began to wobble back and forth. His parachute never deployed. He smashed into the guard rail, flipped end over end several times, and struck a light pole. After the crash, investigators discovered a hole in the engine block which may have had a bearing on causing the crash. He suffered multiple injuries and was transported to Aurora Medical Center in Kenosha where he was later pronounced dead. He was a resident of Frankfort, Illinois, and was survived by his wife, Josephine. Full Name: William Clayton Gnegy, Jr.
Biographical: Just after clocking 298 MPH, he crashed just past the finish line. His dragster hit the retaining wall, flipped, and caught fire. He was from Colleyville, Texas. He died four days after the crash. Biographical: He lost control of his car and veered to the left into the lane of his competitor, Bill Rimmer. He was hit by the other car on the driver side, flipped, and burst into flames. He was transported to Orlando Regional Medical Center where he was pronounced dead. He had his own speed shop in Walled Lake, Michigan. His maroon Mustang was featured in the Kid Rock video "Forever." He held the national record in his class. Biographical: He rolled his new car at the end of the track. He was trapped in the vehicle and without jaws of life at the race track, rescue personnel couldn't extract him before he died. Friends later raised $10,000 to purchase jaws of life and donated it to the race track. He owned an excavating company. 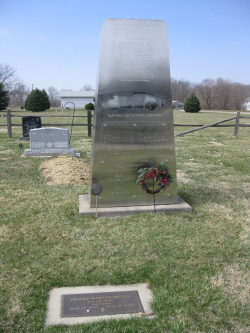 He was from Lee's Summit, Missouri, and was survived by his wife, Susan, and two daughters. 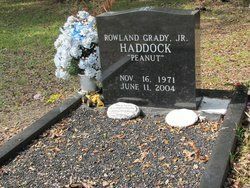 Full Name: Rowland Grady Haddock, Jr.
Biographical: About 100 yards past the finish line on the 1/8th mile drag strip, he lost control of his vehicle on a single run. He swerved and flipped over a guard rail. It took about ten minutes to free him from the car which was upside down. He was transported to Shands Jacksonville Hospital where he was pronounced dead. 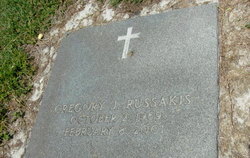 He lived in Hilliard, Florida, and was survived by his wife, Shannon. Biographical: Astride Phil Bainbridge's T/F Puma, Hampson was competing against Ian King. Taking the win, Hampson seemed to have been tossed in front of King in the latter's lane after the finish line by a gust of wind. King was just able to avoid hitting him, but Hampson hit the armco barrier wall hard and was thrown from the bike. He died from his injuries while being transported to the hospital. He was survived by his wife and children. Biographical: He was making a full-wheelstand run on the 1/8th-mile strip, continuing in a wheelstand for about 60 feet beyond the finish line when he lost control and crashed. He had been timed at 82 mph on the run. He was transported to Wilkes Regional Hospital where he was pronounced dead. He was from Wilkesboro, North Carolina. 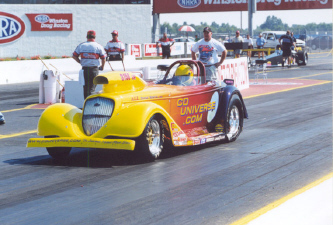 Biographical: When the rear wheels of his car locked up, it caused his dragster to spin. He hit the retaining wall, caught fire, and flipped several times. 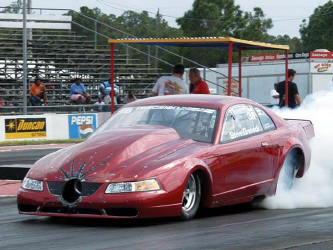 He was traveling about 160 MPH when the wheels locked up 66 feet from the finish line. He lived in Walbridge, Ohio. 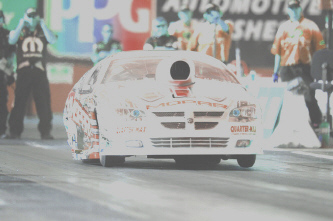 He had finished in eleventh place in the IHRA T/F points standings in 2003. Biographical: He was traveling about 75 MPH when he lost control of his bike and crashed into a wall at the 1/8th-mile track. He was thrown almost 100 feet and died of head injuries at the scene. He lost control when his bike went into a wheelstand when he was shifting gears. He was from Kissimmee, Florida. 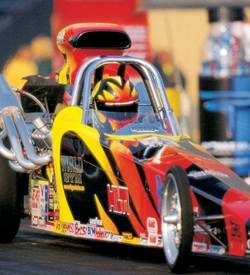 Biographical: He was killed when he crashed his dragster while trying to become certified. He was traveling at an estimated 150 MPH. He was from Eagan, Minnesota. "Race car driver dies in crash before event," Milwaukee Journal Sentinel, June 19, 2001. Biographical: He had just completed his run in eliminations when his car suddenly veered out of control and crossed the center line into the other lane. He struck and slid down the guard rail and hit a telephone pole. His roll cage was ripped off the vehicle. He had just set a national record of 166 MPH and 8 seconds in the A/SR class two weeks before. He had been drag racing for 35 years. 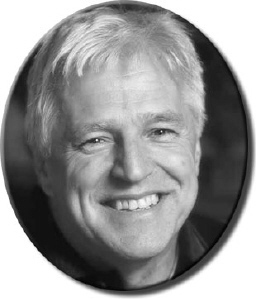 He owned a crane operating company in Chardon, Ohio, where he was active in community affairs. He lived in Munson Township, Ohio, and was survived by his wife, two sons, and a daughter. Car: Ecotec-powered Chevy Cavalier "Summit"
Biographical: While racing his motorcycle, he slammed into the guardrail, flipped over the handlebars, and landed below the railing. He was transported to Sarah Bush Lincoln Health Center where he was pronounced dead. Biographical: He was driving the car of a friend. His car left the race track, flipped several times, hit a ditch, and burst into flames. He was thrown from the car and pronounced dead at the scene. He lived in Inola, Oklahoma. Biographical: Just after making a qualifying run, O'Dell collapsed after getting out of his car. He was transported to Fisher-Titus Hospital in Norwalk, Ohio. He was from South Sioux City, Nebraska, and was survived by his wife, Barbara. 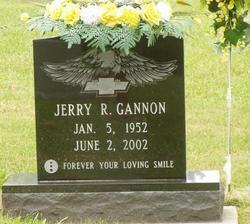 He held the IHRA speed record (205.58 MPH) for Pro Mods at the time of his death. He raced as a team with his son, Kevin, who drove a 1953 Studebaker Pro Mod. He failed to slow down after crossing the finish line at about 120 mph. He went off the end of the strip into the sand trap, whereupon he was thrown from the motorcycle into a pile of old tires. He resided in Medway, Ohio. Biographical: He was testing his dragster's brakes in the pit area when the car suddenly accelerated, crashed, and rolled over. He had been involved in drag racing for twenty years. 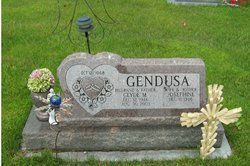 He resided in Paddock Lake, Wisconsin, and was survived by his wife, Allene, four children, his parents, and three brothers. His occupation was data processing consultant. Biographical: When the air scoop on his engine became loose, it jammed into the throttle linkage. This prevented him from slowing the car down and he ran into a ravine at a speed of about 180 MPH. He was killed upon impact. He had owned the 1/8th-mile drag strip for over four years. He lived in Fyffe, Alabama. Biographical: He failed to brake at the end of his run, jolted through the sand trap, and slammed into the safety net. He was conscious and seemed alright, but track officials persuaded him to go to the hospital as a precaution. He walked to the ambulance, so witnesses thought he was alright, but he died at the hospital from a ruptured liver. He was from Thornton, Colorado. 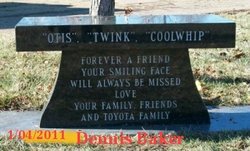 "Frank Quitter Loved Racing, Loved Fixing Motorcycles," Rocky Mountain News, Sep. 4, 2004. Biographical: He was traveling about 80 mph as he neared the finish in the first round of eliminations. He lost control, was thrown into the air, and crashed into a wall. He was transported to Erie County Medical Center where he was pronounced dead. He lived in Palm City, Florida. Biographical: He had crossed the finish line and was traveling at a speed estimated at between 160 and 180 MPH. His parachute may have been sucked under the car and wound around the axle, preventing operation of the brakes. He slammed into two net barriers at the end of the race track. The supercharger was torn off its mounting on this impact and crashed through the car's windshield. This caused fatal head injuries. He was from Loveland, Colorado, and was survived by his wife and four children. Biographical: His vehicle went off the end of the track and flipped. He was transported to Tucson Medical Center where he died the next day. He was a resident of Boring, Oregon. Biographical: When his car hit some fluid on the race track, it skidded off the drag strip and overturned many times. He lived in Fort Pierce, Florida, and was survived by a wife and son. Biographical: His dragster went out of control traveling at about 300 MPH and crashed just past the finish line during the second round of eliminations. After extinguishing the fire, safety officials extracted him from his dragster. He was transported by helicopter to St. Louis Medical Center where he was later pronounced dead. He had been clocked at 322.73 MPH on the run. Debris from an exploding rear tire that entered the driver cockpit caused his death. 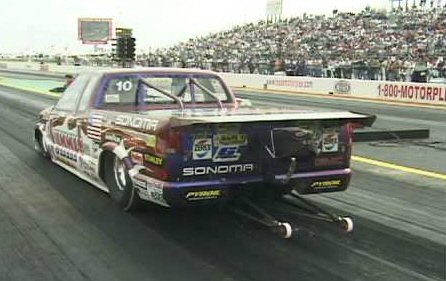 NHRA mandated that all T/F cars use an improved tire that was released by Goodyear immediately after Russell's death and a shield for the roll cage. 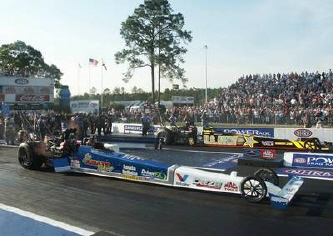 He had been the event's top qualifier and was 4th in the T/F point standings at the time. 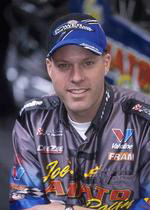 He debuted in T/F in 2001 and became the third driver in NHRA history to win a T/F national event in his first professional start. 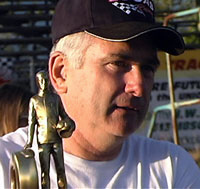 He garnered 2001 NHRA Rookie of the Year honors. During his four-year T/F career he was a six-time national event winner. He was a successful top alcohol driver for several years before entering the professional ranks. He was from Hockley, Texas. Full Name: William Richard Sanders, Jr.
Biographical: He was making a single run in his Dodge Viper during Super Gas qualifying for the special NHRA Division 3 sportsman event when his car went out of control near the finish line. He was transported to Bowling Green Medical Center where he was pronounced dead. 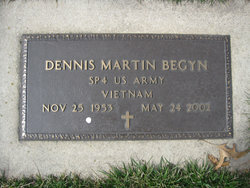 He resided in Benton, Kentucky, and was survived by his wife, Patty. Biographical: He was speeding at 158 MPH in a time trial when the wheels on his rear-engine dragster locked up shortly after crossing the finish line. He flipped multiple times. He was transported to University Hospital in Syracuse where he died from multiple injuries that night. 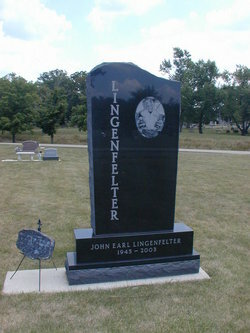 He was a resident of Kirkville, New York, and worked for New Venture Gear as a journeyman repairman. Biographical: He died from an accident at the 1/8th-mile drag strip. Witnesses said he looked over his left shoulder and then hit the guardrail and was thrown from his bike. He was transported to Clarendon Memorial Hospital where he died Sunday night. 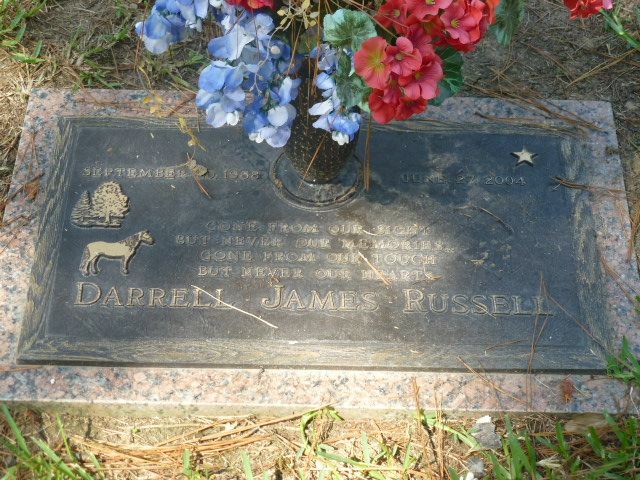 He lived in Sumter and worked at Omni Chemical Company. Full Name: Hubert Sinclair, Jr.
Biographical: He died after losing control of his motorcycle while traveling about 110 MPH. He ran off the right side of the track and struck a chain link fence. He resided in Pembroke, North Carolina. "Racing accident kills man," The Robesonian, Mar. 2003. Biographical: He was killed when he lost control of his vehicle after crossing the finish line of the 1/8th mile track and crashed. His vehicle rolled over several times in a field. He was a resident of Sneedville, Tennessee. Full Name: Stoley J. Waiters, Jr.
Biographical: When he started to turn left near the end of his run on the 1/8th-mile drag strip, his car flipped on its side. The car continued to flip side over side before coming to rest in a wooded area away from the concrete track. He was thrown from the car and pronounced dead at the scene. He was from Horatio, South Carolina. Biographical: Traveling at a speed estimated at more than 125 MPH, he tried to brake but lost control of the vehicle. His limited edition sports car crashed through some barriers, became airborne, then hit a wall and burst into flames. He had multiple traumatic injuries and burns and was in cardiac arrest at the scene. He was transported to Blacktown Hospital where he was pronounced dead. He was from Windsor, Australia. Four of the officials at the race track were later brought up on manslaughter charges. 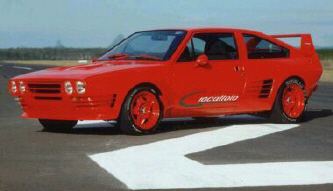 This is one of the fifteen Giocattolo cars built between 1986 and 1989 in Australia. 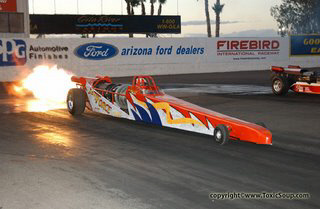 Biographical: When he experienced engine failure, he crashed his funny car hard into the guard rail. He remained in the hospital in Cleveland, Ohio, for over six years until his death with multiple fractures and head injuries. He was survived by his wife and daughter. 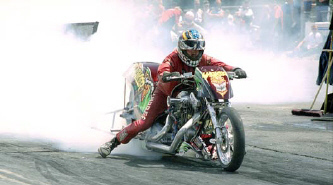 He was a successful drag racer for many years. He was the 1979 NHRA Pro Comp champion and won the U.S. Nationals in 1979 and 1980. At various times he competed in Top Fuel, Nitro Funny Car, Top Alcohol Funny Car, and Top Alcohol Dragster.